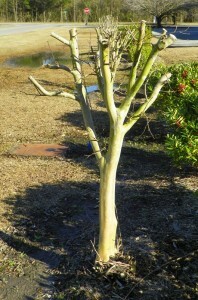 Everyone has their own story for how and why to prune crepe myrtles. But how much of it is actually fact? Pruning methods that promote a sound tree structure help trees resist failure, provide clearance, and improve aesthetics, while promoting long life. From training young trees to managing mature ones, structural pruning to guide and manage tree architecture should be the primary goal each time a tree is pruned. A well-structured tree is aesthetically pleasing, preserves the crown as it grows larger, and is long-lived. Poor tree architecture can be costly, leading to failure and early tree removal. When improperly performed, pruning can harm the tree’s health, stability, and appearance and make matters worse. Ok, so it is important to prune a tree. I get it, you get it, everyone gets it. But we’re talking about crepe myrtle pruning, right? So what about those? Like all trees, pruning a crape myrtle involves enhancing its natural form rather than trying to force it to grow in a space that is too small or an artificial shape. Crape myrtles naturally grow as small upright or vase shaped trees with multiple trunks. In a well pruned crape myrtle, the trunks grow upward and outward, with branches fanning out rather than growing inward into the center of the tree. I don’t think that could be any more well written than it is. Most people see their neighbors outside clipping away, so happy go lucky, not paying attention to what the sole purpose of pruning actually is. The goal is to preserve the natural shape of the tree – not turn it into a bush. Topping and lopping any and everywhere not only looks ridiculous, but ultimately harms the plant and inhibits bloom production! Take a look at the picture. If that’s your crepe myrtle, well first I apologize, but secondly, you’re doing it wrong. So next time you see Mr. Jones out there chainsaw happy commiting Crepe Murder, refer him back to our blog, then laugh, smile, and pour him a beer. He’ll need it all summer long as he watches his unhappy trees under perform… again. Be sure to contact us if you have any questions about pruning crepe myrtles or any other tree and shrub. And don’t forget our sister company, Top Notch Tree Service! They can walk you through just about anything tree related you might ever need!